JUST REPRICED FROM $44,995. CARFAX 1-Owner. LT trim. 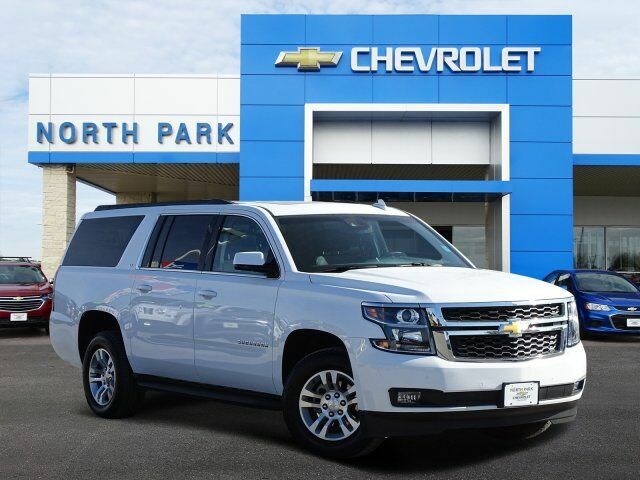 Heated Leather Seats, DVD Entertainment System, Navigation, AUDIO SYSTEM, CHEVROLET MYLINK RADIO WITH NAVIGATION AND 8" DIAGONAL COLOR TOUCH-SCREEN, Rear Air, Aluminum Wheels. CLICK ME! SUN, ENTERTAINMENT AND DESTINATIONS PACKAGE includes additional 9 months of SiriusXM Radio and NavTraffic service, (CF5) power sunroof, (U42) rear seat DVD entertainment system and (IO6) Chevrolet MyLink radio with navigation, LUXURY PACKAGE includes additional 9 months of SiriusXM Radio, (AS8) power fold third row 60/40 split bench seats, (ATH) Passive Entry System, (ATT) second row power release 60/40 split folding bench seat, (BTM) keyless start, (DL3) outside heated power-adjustable, power-folding mirrors, (KA6) heated second row seats, (N38) memory power tilt and telescopic steering column, (TC2) Hands free liftgate, (T3U) fog lamps, (UD5) Front and Rear Park Assist, (UFG) Rear Cross-Traffic Alert, (UKC) Lane Change Alert with Side Blind Zone Alert and (UVD) heated steering wheel and color key rear fascia trailer hitch closeout, ENTERTAINMENT SYSTEM, REAR SEAT, BLU-RAY/DVD with remote control, overhead display, Wi-Fi wireless projection capability, four 2-channel wireless digital headphones Privacy Glass, Steering Wheel Controls, Child Safety Locks, Alarm, Electronic Stability Control, Bucket Seats, Adjustable Pedals.